My classmates always wonder why I am African but speak Portuguese and understand Spanish. Maybe if my friends knew about my country, Guinea-Bissau, they would know why I speak Portuguese. Guinea-Bissau is located in West Africa between Guinea and Senegal. Guinea-Bissau is a very small country with a total population of about 1.4 million people. The area is small. It is about the size of Rhode Island, one of the smallest states in the U.S.
We speak Portuguese in Guinea-Bissau because Portugal colonized the country. 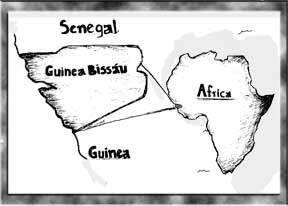 More than 400 years ago the Portuguese discovered Guinea-Bissau and later on they started colonizing the country. Portuguese is similar to Spanish, so it is not hard for me to understand and speak some Spanish. On September 24, 1973 Guinea-Bissau got independence from Portugal, and Portuguese became the official language. From the date of independence to 1980 Luis Cabral was the president. From 1981 to 1998 Bernardo Viera was the president, and from 1998 to 2003 Kumba Yala was the president. Now Kumba Yala is out of power and we have Henrique Rosa as the president. When I was in Guinea-Bissau I did a lot fun things with my family and friends. Sometimes when we were on vacation from school, my family and I always went to the village to help my grandma on the farm with tomatoes, lettuce, okra, and some other things. My aunt has a big house near the beach and we always went there with friends to have fun. I always think of going back to Guinea-Bissau because I miss my friends, family and the things that I always did. But I want to go to college first. After that, I can go back to visit my family and friends.